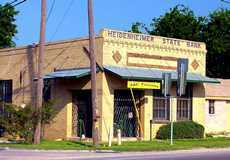 The bank that opened in 1914 is still in use � as a gun store. 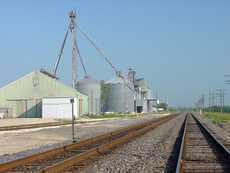 The town was built near the Atchison, Topeka and Santa Fe tracks in 1881 and the post office opened the same year. The town was named to honor S. Heidenheimer, director of the railroad. In 1884 the population was a mere 75 people with only the basic businesses that comprised a proper town. Two years later, the population had risen to 225 and a newspaper was included in the town抯 businesses. The town reached its zenith of 250 people in 1925, but by 1948 it had lost fully half of that. The railroad is still the most active area of town � with grain elevators and a working gin.